Maintenance from Afar - De website van salvettifoundation! Wind farms must be maintained. Wind turbines are not easy to access. Remote monitoring software offers the ability to diagnose the operational condition from a far off location. There are more than 197,000 wind turbines in the world, according to the American Wind Energy Association. Like any machine, keeping them running efficiently requires regular maintenance. The average annual cost of that maintenance, says Wind Measurement International, ranges from 1.5 to 3 percent of the original purchase price of a turbine. To build a 2MW wind turbine, manufacturers spend approximately US $3 million. Maintenance costs can quickly rise, though, if wind farm operators aren’t vigilant about addressing problems early. Accomplishing that requires monitoring. Wind farm operators make use of condition-monitoring tools to keep an eye on the equipment inside the hub and nacelle of a turbine without visiting the structure each day. For example, with sensors attached to generators and bearings, it is possible to assess the condition of things such as hydraulic fluid and oil levels. Accelerometers are another tool. They are electromechanical devices that measure forces and can serve a role in condition monitoring. Accelerometers gauge constant forces such as gravity or dynamic forces like the vibration of a gearbox inside a turbine. Pitch remote terminal software is an example of a diagnostic tool for analyzing and monitoring both real-time and logged data about a turbine’s pitch control operations. Blade pitch control systems regulate wind turbine rotor speed and, therefore, power for wind turbines and serve as aerodynamic brakes for the turbine. Most of the blade pitch control components reside in the hub of the wind turbine’s prop, which is often 75 meters or more above the ground or water surface. A wind turbine has to adjust and maintain the inclination angle, or pitch, of a turbine’s blades for two primary reasons. First, the turbine needs to accelerate to reach an optimum energy-producing speed. Second, when wind conditions are strong, the turbine needs a failsafe to put the blades at an angle where the load is reduced. 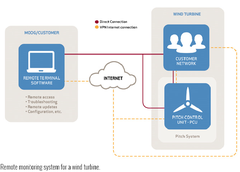 High-performance pitch control systems serve land-based and offshore wind turbines in both ways. Keeping a pitch system in good working order is critical to getting the most from a wind farm owner’s investment in a turbine. Visually inspecting a turbine is, of course, one method for assessing how well the equipment is functioning. But the cost and resources required to access the hub of a wind turbine can be significant, as OEMs and wind farm operators know. Consider the difficulty of deploying maintenance staff onto an offshore turbine in poor weather. On most fixed offshore structures, like an oil production platform, service technicians can reach the trouble spot with the use of a helicopter. But, obviously, this is more complicated and risky with a wind turbine. In rough seas, maintenance crews using small boats have to wait until calmer conditions permit both routine and unscheduled maintenance. While a crew waits for the opportunity to perform maintenance, the turbine may sit inoperative or run less efficiently. For example, when an electrical component fails in a turbine, which is the most common cause of stoppages, the unit can be off line for approximately 1.5 days. If a wind farm operator can reduce unplanned stops, then he increases profitability. Software for remotely monitoring pitch systems highly reduces the need for unscheduled, time-consuming and costly on-site service visits and plays a role in reducing wind power cost of energy (COE). Like other condition monitoring tools, pitch remote monitoring software offers users the ability to diagnose the operational condition from a far off location. Wind farm operators can use pitch remote monitoring software to schedule preventative maintenance, perform troubleshooting with integrated tools like a remote software oscilloscope, diagnose potential issues and plan on-site service work. IO (input/output) information screen, technicians can see the detailed status of a turbine’s three, pitch servo drives as well as the pitch control unit. System logs, diagnosis data and data visualization via software oscilloscope offer advanced functions for pitch system analysis. Moog pitch remote terminal software also includes centralized, electronic service logs, which technicians can use to review past repairs and prepare, for example, a checklist of material for upcoming maintenance work. Large numbers of wind turbines are situated in places difficult to reach by service personnel (e.g. offshore wind farms), so it is essential for wind farm operators to have technology to remotely monitor and control turbines in any kind of environment. Diagnostic technology now available gives wind farm operators a way to “see” problems from afar. They can schedule preventative maintenance to correct issues before problems multiply and cause a turbine to fail. With diagnostics and data, wind farm operators can reduce maintenance costs.